The coolest looking blue berries drew my attention to this weedy plant the first time I saw it when taking a walk near the Conestoga Creek. 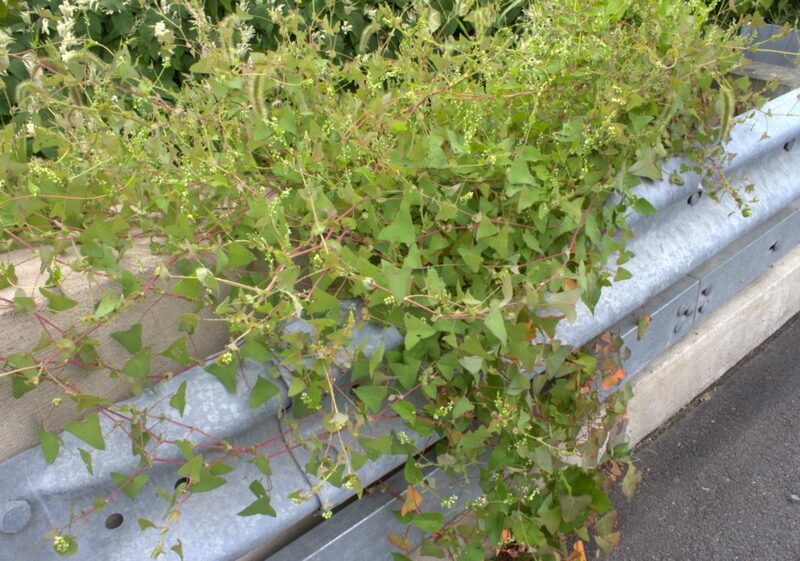 I was reminded of that Autumn day trip to Lancaster County, Pennsylvania a number of years ago when I recently spotted the same kind of plant scrambling along a cement bridge in Snyder County, PA. Right away I could see its vine-like nature and that its leaves were triangular. The vine had climbed from a stream bank up and over the top of the bridge and down onto the guard rail. The vine appeared to be growing well and it seemed to be liking its sunny spot very much as many small white flowers were present. Triangular leaves and pink stems with thumb-tearing spikes. Don’t try to weed out this plant without a sturdy pair of gloves on your hands! 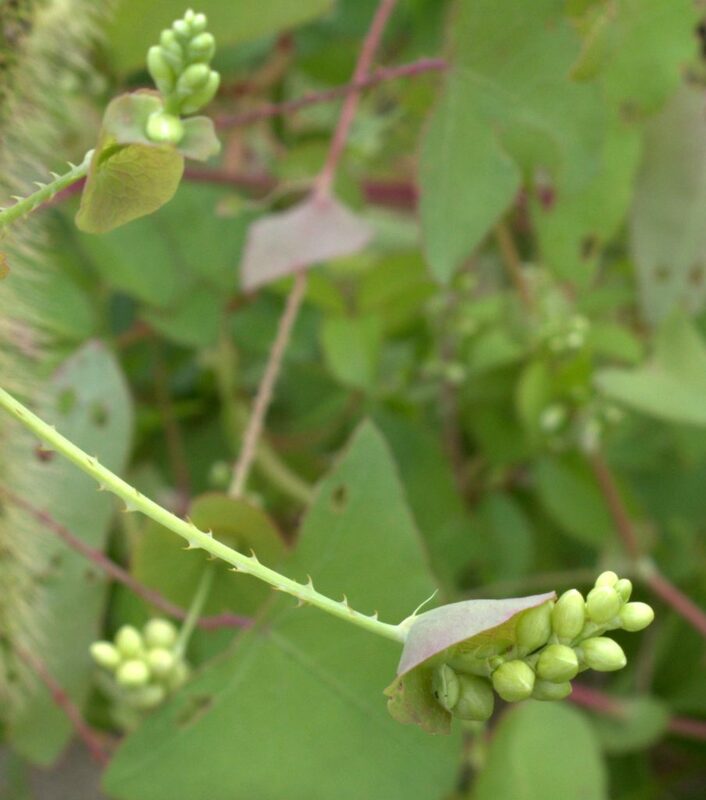 Closeup of backward-facing thorns on stem and flower buds in cup of perfoliate leaf. It was late summer so I looked for the blue berries and was delighted to see them tucked behind a few leaves. Blue berries of tearthumb and its small white bell-like flowers. The berries have this pearly sheen and a really attractive iridescent quality. 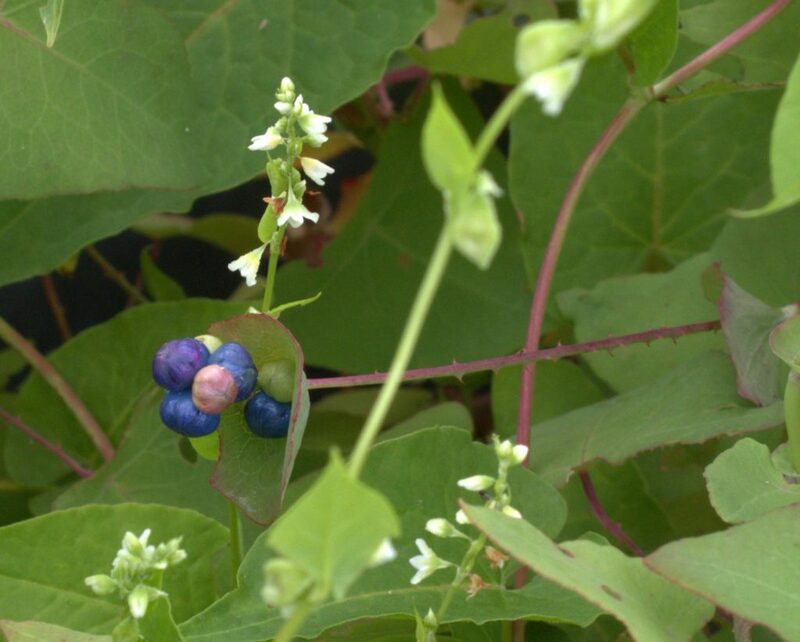 Closeup of iridescent blue berries that start out green, turn pink, then blue. Unfortunately, this is one invasive weed! Tear Thumb, Persicaria perfoliata, will grow so quickly that another name it’s given is “Mile-a-Minute” weed! Due to this fast-growing feature, tear-thumb is on Pennsylvania’s Noxious Weed List. If you see it or have it on your property, pull it out – with gloves on! – or burn it to get rid of it before it takes over. Tear-thumb was previously known as Polygonum perfoliatum, or Asiatic Tearthumb. 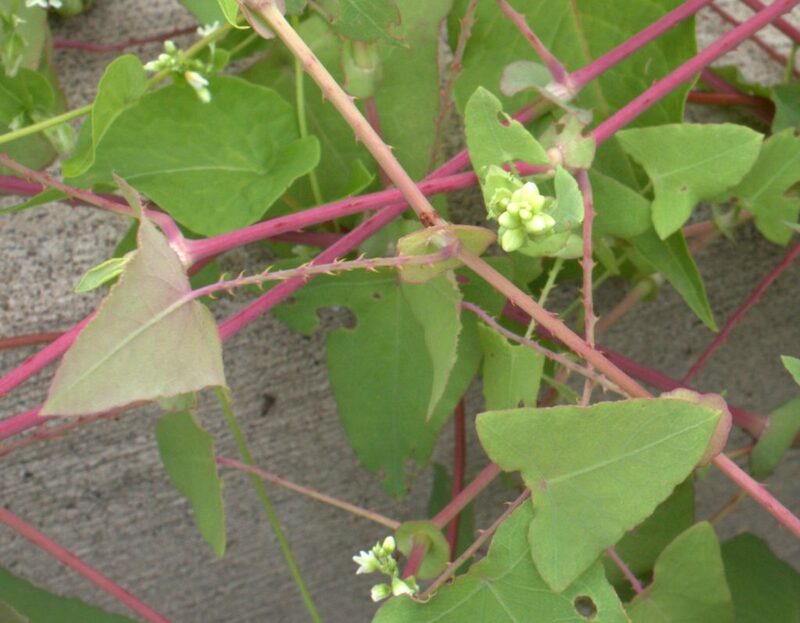 As a prior member of the Buckwheat Family, Polygonaceae, and of the Genus Polygonum, it is closely related to knotweeds. Knotweeds are also some of the most invasive plants noted for quick growth. If you do try to tear this weed out, just remember that doing so in the Spring will give you a head start at battling seed production. Also, the recurved spines aren’t hardened until summertime, so it should be easier task in the earlier parts of the growing season. Those little spikes are on the backs of the leaves and the stems which helps the plant climb up and over existing vegetation, fences, and the like to get to a brighter location so it can grow better. This climbing and clinging habit acts to block out the light for the sorry plants underneath it, so some native plants just can’t compete with Mile-A-Minute. If attempting to manually destroy the plant after Summer begins, don’t forget about the seeds. Next year, and for another few years, look for new plant sprouts where the old plant was located. Seeds will continue to germinate randomly for a number of years! More help is available from the Plant Conservation Alliance to eradicate this Least Wanted Alien Weed. Good luck!